Banff National Park is Canada's oldest national park, established in 1885. Located in the Canadian Rockies, the park is 80 miles west of Calgary in the province of Alberta. It encompasses 2,564 square miles of mountainous terrain, with numerous glaciers and ice fields, dense coniferous forest, and alpine landscapes. The Icefields Parkway extends from Lake Louise, connecting to Jasper National Park in the north. Provincial forests and Yoho National Park are neighbors to the west, while Kootenay National Park is located to the south and Kananaskis Country to the southeast. The main commercial center of the park is the town of Banff, in the Bow River valley. 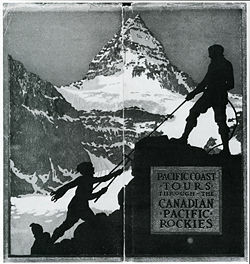 The Canadian Pacific Railway was instrumental in Banff's early years, building the Banff Springs Hotel and Chateau Lake Louise, and attracting tourists through extensive advertising. In the early twentieth century, roads were built in Banff, at times by war internees, and through depression-era public works projects. Since the 1960s, park accommodations have been open all year, with annual tourism visits to Banff increasing to over 5 million in the 1990s. Millions more pass through the park on the Trans-Canada Highway. As Banff is one of the world's most visited national parks, the health of its ecosystem has been threatened. In the mid-1990s, Parks Canada responded by initiating a two-year study, which resulted in management recommendations, and new policies that aim to preserve ecological integrity. 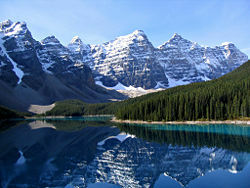 Banff National Park is located on Alberta's western border with British Columbia. Banff is about an hour and half driving distance from Calgary, and four hours from Edmonton. Jasper National Park is located to the north, while Yoho National Park is to the west, and Kootenay National Park is to the south. Kananaskis Country, which includes Bow Valley Wildland Provincial Park, Spray Valley Provincial Park, and Peter Lougheed Provincial Park, is located to the south and east of Banff. The Trans-Canada Highway passes through Banff National Park, from the eastern boundary near Canmore, through the towns of Banff and Lake Louise, and into Yoho National Park in British Columbia. 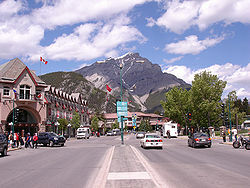 The Banff townsite is the main commercial center in the national park. The village of Lake Louise is located at the junction of the Trans-Canada Highway and the Icefields Parkway, which extends north to the Jasper townsite. The Town of Banff, established in 1883, is the main commercial center in Banff National Park, as well as a center for cultural activities. Banff is home to several cultural institutions, including the Banff Center, the Whyte Museum, the Buffalo Nations Luxton Museum, Cave and Basin National Historic Site, and several art galleries. Throughout its history, Banff has hosted many annual events, including Banff Indian Days which began in 1889, and the Banff Winter Carnival. Since 1976, The Banff Center has organized the Banff Mountain Film Festival. In 1990, the town was incorporated as a municipality of Alberta, though still subject to the Canada National Parks Act and federal authority in regards to planning and development. As of the 2005 census, the Town of Banff had a population of 8,352, of which nearly 7,000 were permanent residents. The Bow River flows through the town of Banff, with the Bow Falls located on the outskirts of town. 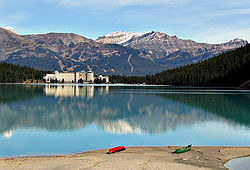 Lake Louise, a small village located 32 miles west of the Banff townsite, is home to the landmark Chateau Lake Louise at the edge of Lake Louise. Located 9.3 miles from Lake Louise, Moraine Lake provides a scenic vista of the Valley of the Ten Peaks. This scene was pictured on the back of the $20 Canadian banknote, in the 1969–1979 ("Scenes of Canada") series. The Lake Louise Mountain Resort is also located near the village. The Icefields Parkway, which extends 143 miles, connects Lake Louise to Jasper, Alberta. 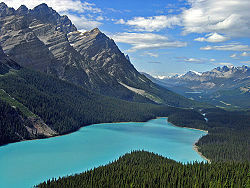 The Parkway originates at Lake Louise, and extends north up the Bow Valley, past Hector Lake, Bow Lake, and Peyto Lake. The Parkway then crosses a summit, and follows the Mistaya River to Saskatchewan Crossing, where it converges with the Howse and North Saskatchewan River. The North Saskatchewan River flows east from Saskatchewan Crossing, out of Banff, into what is known as David Thompson country, and onto Edmonton. The David Thompson Highway follows the North Saskatchewan River, past the man-made Abraham Lake, and through David Thompson Country. North of Saskatchewan Crossing, the Icefields Parkway follows the North Saskatchewan River up to the Columbia Icefield. The Parkway crosses into Jasper National Park at Sunwapta Pass at 6,635 feet in elevation, and continues from there to the Jasper townsite. Located on the eastern side of the Continental Divide, Banff National Park receives an annual average of 19 inches of precipitation. This is considerably less than is received in Yoho National Park on the western side of the divide in British Columbia, with 35 inch annual precipitation at Wapta Lake and 26 inches at Boulder Creek. Ninety-two inches of snow falls on average each winter in the Banff townsite, while 114 inches falls in Lake Louise. During winter months, temperatures in Banff are moderate, compared to Edmonton and other areas of central and northern Alberta, due to Chinook winds and other influences from British Columbia. The mean low temperature during January is -6° F, and the mean high temperature is -24°F for the Town of Banff. Weather conditions during summer months are pleasant, with high temperatures during July averaging 71°F, and daily low temperatures averaging 45°F. The Canadian Rockies consist of several northwest-southeast trending ranges. Closely following the continental divide, the Main Ranges form the backbone of the Canadian Rockies. The Front Ranges are located east of the Main Ranges. Banff National Park extends eastward from the continental divide and includes the eastern slope of the Main Ranges and much of the Front Ranges. The latter include the mountains around the Banff townsite. 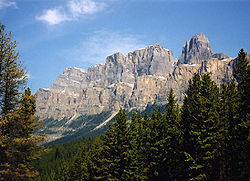 The foothills are located to the east of the Park, between Calgary and Canmore. On the other side of the Park, the Western Ranges pass through Yoho and Kootenay National Parks. 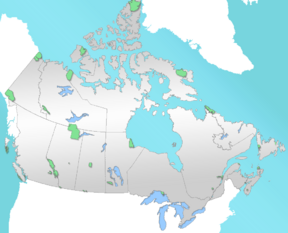 Still farther west is the Rocky Mountain Trench, the western boundary of the Canadian Rockies region in British Columbia. The Canadian Rockies are composed of sedimentary rock, including shale, sandstone, limestone, and quartzite, that originated as deposits in a shallow inland sea. The geologic formations in Banff range in age from Precambrian eon to the Jurassic period. The mountains were formed 80–120 million years ago, as a product of thrust faults. Over the past 80 million years, erosion has taken its toll on the landscape, with more extensive erosion occurring in the foothills and Front Range than in the Main Range. Banff's mountains exhibit several different shapes that have been influenced by the composition of rock deposits, layers, and their structure. Numerous mountains in Banff are carved out of sedimentary layers that slope at 50–60 degree angles. Such dip slope mountains have one side with a steep face, and the other with a more gradual slope that follows the layering of the rock formations, such as the example of Mount Rundle, near the Banff townsite. Other types of mountains in Banff include complex, irregular, anticlinal, synclinal, castellate, dogtooth, and sawback mountains. Castle Mountain exemplifies a castellate shape, with steep slopes and cliffs. The top section of Castle Mountain is composed of a layer of Paleozoic-era shale, sandwiched between two limestone layers. Dogtooth mountains, such as Mount Louis, exhibit sharp, jagged slopes. The Sawback Range, which consists of dipping sedimentary layers, has been eroded by cross gullies. Scree deposits are common toward the bottom of many mountains and cliffs. Banff's landscape has also been marked by glacial erosion, with deep U-shaped valleys and many hanging valleys that often form waterfalls. Matterhorn-type mountains, such as Mount Assiniboine, have been shaped by glacial erosion that has left a sharp peak. A number of small gorges also exist, including Mistaya Canyon and Johnston Canyon. Outlets of Wapta Icefield on the Banff side of the continental divide include Peyto, Bow, and Vulture Glaciers. Bow Glacier retreated an estimated 3,600 feet between the years 1850 and 1953, and since that period, there has been further retreat which has left a newly formed lake at the terminal moraine. Peyto Glacier has retreated approximately 6561 feet since 1880, and is at risk of disappearing entirely within the next 30 to 40 years. Both Crowfoot and Hector Glaciers are also easily visible from the Icefields Parkway, yet they are singular glaciers and are not affiliated with any major icesheets. Banff National Park spans three ecoregions, including montane, subalpine, and alpine. The subalpine ecoregion, which consists mainly of dense forest, comprises 53 percent of Banff's area. Twenty-seven percent of the park is located above the tree line, in the alpine ecoregion. The tree line in Banff lies approximately at 7,544 ft., with open meadows at alpine regions and some areas covered by glaciers. A small portion (3 percent) of the park, located at lower elevations, is in the montane ecoregion. Lodgepole pine forests dominate the montane region of Banff, with Englemann spruce, willow, aspen, occasional Douglas-fir and a few Douglas maple interspersed. Englemann spruce are more common in the subalpine regions of Banff, with some areas of lodgepole pine, and subalpine fir. The montane areas, which tend to be the preferred habitat for wildlife, have been subjected to significant human development over the years. The Park has 56 recorded mammal species Grizzly and Black bears inhabit the forested regions. Cougar, Lynx, Wolverine, weasel, Northern River Otter and wolves are the primary predatory mammals. Elk, Mule Deer and White-tailed Deer are common in the valleys of the park, including around (and sometimes in) the Banff townsite, while Moose tend to be more elusive, sticking primarily to wetland areas and near streams. In the alpine regions, Mountain Goats, Bighorn Sheep, marmots and pika are widespread. Other mammals such as Beaver, Porcupine, squirrel, chipmunks are the more commonly observed smaller mammals. In 2005, a total of five caribou where counted, making this species one of the rarest mammals found in the park. Due to the harsh winters, the park has few reptiles and amphibians with only one species of toad, three species of frog, one salamander species and two species of snakes that have been identified. At least 280 species of birds can be found in Banff including Bald and Golden Eagles, Red-tailed Hawk, Osprey, Falcon and Merlin, all of which are predatory species. Additionally, commonly seen species such as the Gray Jay, American Three-toed Woodpecker, Mountain Bluebird, Clark's Nutcracker, Mountain Chickadee and pipit are frequently found in the lower elevations. The White-tailed Ptarmigan is a ground bird that is often seen in the alpine zones. Rivers and lakes are frequented by over a hundred different species including loons, herons, and mallards who spend their summers in the park. Endangered species in Banff include the Banff Springs Snail Physella johnsoni which is found in the Park's hot springs. Woodland caribou, found in Banff, are listed as a threatened species, as are grizzly bears. Mountain pine beetles have caused a number of large-scale infestations in Banff National Park, feeding off of the phloem of mature lodgepole pines. Alberta's first known outbreak occurred in 1940, infecting 17 square miles of forest in Banff. A second major outbreak occurred in the late 1970s and early 1980s in Banff and the surrounding Rocky Mountains region. Elk are not indigenous to Banff, and were introduced in 1917 with 57 elk brought in from Yellowstone National Park. 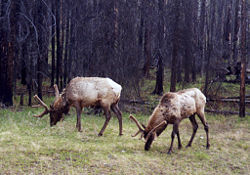 The introduction of elk to Banff, combined with controls on coyote and wolves by Parks Canada beginning in the 1930s, has caused an imbalance of the ecosystem. Other species that have been displaced from the Bow Valley include grizzly bears, cougars, lynx, wolverines, otter and moose. Beginning in 1985, gray wolves were recolonizing areas in the Bow Valley. However, the wolf population has struggled, with 32 wolf deaths along the Trans-Canada Highway between 1987 and 2000, leaving only 31 wolves in the area. Archaeological evidence found at Vermilion Lakes (radiocarbon) dates the first human activity in Banff to 10,300 B.C.E. Prior to European contact, native peoples, including the Stoneys, Kootenay, Tsuu T'ina, Kainai, Peigans, and Siksika, were common in the region, where they hunted bison and other game. With the admission of British Columbia to Canada on July 20, 1871, Canada agreed to build a transcontinental railroad. Construction of the railroad began in 1875, with Kicking Horse Pass chosen, over the more northerly Yellowhead Pass, as the route through the Canadian Rockies. In the autumn of 1883, three Canadian Pacific Railway construction workers stumbled across a cave containing hot springs on the eastern slopes of Alberta's Rocky Mountains. This was the "discovery" of the area which eventually became Banff National Park. With conflicting claims over discovery of hot springs in Banff, Prime Minister John A. Macdonald decided to set aside a small reserve of 10 square miles around the hot springs at Cave and Basin as a public park in 1885. Under the Rocky Mountains Park Act, enacted on June 23, 1887, the park was expanded to 260 square miles and named Rocky Mountains Park. This was Canada's first national park, and the second established in North America, after Yellowstone National Park. The Canadian Pacific Railway built the Banff Springs Hotel and Chateau Lake Louise to attract tourists and increase the number of rail passengers. Early on, Banff was popular with wealthy European tourists, who arrived in Canada via trans-Atlantic luxury liner and continued westward on the railroad, as well as upper-class American and English tourists. Some visitors participated in mountaineering activities, often hiring local guides. Tom Wilson, along with Jim and Bill Brewster, was among the first outfitters in Banff. The Alpine Club of Canada, established in 1906 by Arthur Oliver Wheeler and Elizabeth Parker, organized climbs and camps in the backcountry. By 1911, Banff was accessible by automobile from Calgary. Beginning in 1916, the Brewsters offered motorcoach tours of Banff. In 1920, access to Lake Louise by road was available, and the Banff-Windermere Road opened in 1923 to connect Banff with British Columbia. In 1902, the park was expanded to cover 4,402 square miles, encompassing areas around Lake Louise, and the Bow, Red Deer, Kananaskis, and Spray rivers. Bowing to pressure from grazing and logging interests, the size of the park was reduced in 1911 to 1,800 square miles, eliminating many foothills areas from the park. Park boundaries changed several more times up until 1930, when the size of Banff was fixed at 2,586 square miles, with the passage of the Canadian National Parks Act. With the construction of a new east gate in 1933, Alberta transferred 207.5 acres to the park. This, along with other minor changes—both additions to and subractions from—to the park boundaries in 1949, set the area of the park at 2,564 square miles. The CNP Act of 1930 also renamed the park as Banff National Park, named for the Canadian Pacific Railway station, which in turn was named after the Banffshire region in Scotland. In 1887, local native tribes signed Treaty 7, which gave Canada rights to explore the land for resources. At the beginning of the twentieth century, coal was mined near Lake Minnewanka in Banff. For a brief period, a mine operated at Anthracite, but was shut down in 1904. The Bankhead mine, at Cascade Mountain, was operated by the Canadian Pacific Railway from 1903 to 1922. In 1926, the town was dismantled, with many buildings moved to the town of Banff and elsewhere. During World War I, immigrants from Austria, Hungary, Germany, and Ukraine were sent to Banff to work in internment camps. The main camp was located at Castle Mountain, and was moved to Cave and Basin during winter. Much early infrastructure and road construction was done by these internees. In 1931, the Government of Canada enacted the Unemployment and Farm Relief Act which provided public works projects in the national parks during the Great Depression. In Banff, workers constructed a new bathhouse and pool at Upper Hot Springs, to supplement Cave and Basin. Other projects involved road building in the park, tasks around the Banff townsite, and construction of a highway connecting Banff and Jasper. In 1934, the Public Works Construction Act was passed, providing continued funding for the public works projects. New projects included construction of a new registration facility at Banff's east gate, and construction of an administrative building in Banff. By 1940, the Icefields Parkway reached the Columbia Icefield area of Banff, and connected Banff and Jasper. Internment camps were once again set up in Banff during World War II, with camps stationed at Lake Louise, Stoney Creek, and Healy Creek. Prison camps were largely composed of Mennonites from Saskatchewan. 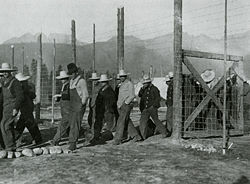 Japanese internment camps were not stationed in Banff during World War II, but rather were located in Jasper National Park where their detainees worked on the Yellowhead Highway and other projects. Banff National Park is the most visited Alberta tourist destination and one of the most visited national parks in North America, with 3.8 million visitors in 2015/2016. Tourism in Banff contributes an estimated C$6 billion annually to the economy. 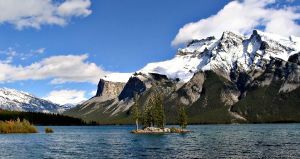 Attractions in Banff include Upper Hot Springs, a 27-hole golf course at Fairmont Banff Springs Hotel, and three ski resorts including Sunshine Village, Lake Louise Mountain Resort, and Mount Norquay ski resort. Day hikes, such as the Cory Pass Loop, are popular with visitors. Other activities include alpine and Nordic skiing and horseback riding. Backcountry activities include hiking, camping, climbing, and skiing. Winter tourism in Banff began in February 1917, with the first Banff Winter Carnival. The carnival featured a large ice palace, which was built by internees. Carnival events included cross-country skiing, ski jumping, curling, snowshoe, and skijoring. In the 1930s, the first downhill ski resort, Sunshine Village, was developed by the Brewsters. Mount Norquay ski area was also developed during the 1930s, with the first chair lift installed in 1948. Since 1968, when Banff Springs Hotel was winterized, Banff has been a year-round destination. In the 1960s, the Trans-Canada Highway was constructed, providing another transportation corridor through the Bow Valley, in addition to the Bow Valley Parkway, making the park more accessible. Also in the 1960s, Calgary International Airport was built. Canada launched several bids to host the Winter Olympics in Banff, with the first bid for the 1964 Olympics, which were eventually awarded to Innsbruck, Austria. Canada narrowly lost a second bid, for the 1968 Olympics, which were awarded to Grenoble, France. Once again, Banff launched a bid to host the 1972 Olympics, with plans to hold the Olympics at Lake Louise. The 1972 bid was most controversial, as environmental lobby groups provided strong opposition to the bid, which had sponsorship from Imperial Oil. Bowing to pressure, Jean Chrétien, then the head of Parks Canada, withdrew support for the bid, which was eventually lost to Sapporo, Japan. 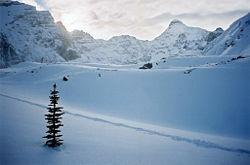 Several events were hosted at the Canmore Nordic Center at Canmore, Alberta, located just outside the eastern gates of Banff National Park on the Trans-Canada Highway, when nearby Calgary, Alberta was awarded the 1988 Winter Olympics. Banff National Park is managed by Parks Canada, under the National Parks Act which was passed in 1930. Over time, park management policies have increasingly emphasized environmental protection over development. In 1964, a policy statement was issued that reiterated ideals of conservation laid out in the 1930 act. 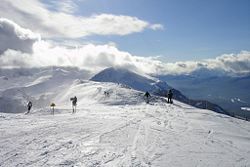 With the controversial bid for the 1972 Winter Olympics, environmental groups became more influential, leading Parks Canada to withdraw its support for the bid. The 1979 Beaver Book was a major new policy, which emphasized conservation. In 1988, the National Parks Act was amended, making the maintenance of ecological integrity the top priority. The amendment also paved the way for non-governmental organizations to challenge Parks Canada in court, for breaches in adhering to the act. In 1994, Parks Canada established revised "Guiding Principles and Operating Policies," which included a mandate for the Banff-Bow Valley Study to draft management recommendations. 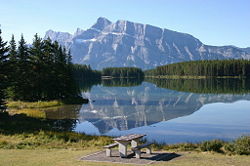 As with other national parks, Banff is required to have a Park Management Plan. On a provincial level, the park area and the included communities (other than the Town of Banff which is an incorporated municipality) are administered by Alberta Municipal Affairs as Improvement District No. 9 (Banff). The Trans-Canada Highway, passing through Banff, has been problematic, posing hazards for wildlife due to vehicle traffic and as an impediment to wildlife migration. Grizzly bears are among the species impacted by the highway, which together with other developments in Banff, has caused fragmentation of the landscape. Grizzly bears prefer the montane habitat, which has been most impacted by development. Wildlife crossings, including a series of underpasses, and two wildlife overpasses, have been constructed at a number of points along the Trans-Canada Highway to help alleviate this problem. Since the original Rocky Mountains Park Act, subsequent acts and policies placed greater emphasis on conservation. With public sentiment tending towards environmentalism, Parks Canada issued major new policy in 1979, which emphasized conservation. The National Parks Act was amended in 1988, which made preserving ecological integrity a top priority. The act also required each park to produce a management plan, with greater public participation. During the 1980s, Parks Canada moved to privatize many park services such as golf courses, and added user fees for use of other facilities and services to help deal with budget cuts. In 1990, the Town of Banff was incorporated, giving local residents more say regarding any proposed developments. While the National Parks Act and the 1988 amendment emphasize ecological integrity, in practice Banff has suffered from inconsistent application of the policies. In response to this, in the 1990s, development plans for the park, including expansion at Sunshine Village, were under fire with lawsuits filed by Canadian Parks and Wilderness Society (CPAWS). 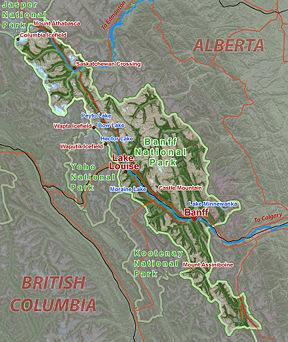 In the mid-1990s, the Banff-Bow Valley Study was initiated to find ways to better address environmental concerns, and issues relating to development in the park. While the two-year study was underway, development projects were halted, including the expansion of Sunshine Village, and the twinning of the Trans-Canada Highway between Castle Junction and Sunshine. ↑ C.S.L. Ommanney. 2002. Glaciers of the Canadian Rockies, Professional Paper 1386-J U.S. Geological Survey. Retrieved November 21, 2007. ↑ D. Scott and B. Jones, Climate Change & Banff National Park: Implications for Tourism and Recreation Tourism Management 28 (2007): 570–579. Retrieved May 19, 2016. ↑ WWF International. Going, Going, Gone, Climate Change and Global Glacier Decline Retrieved November 21, 2007. ↑ Sheila Robinson, The Natural and Human History of Banff National Park Parks Canada, 1978. Retrieved May 19, 2016. ↑ Vicki Barnett. "Native fish stocks drastically down in central Rockies." Calgary Herald. March 10, 1996. D1. ↑ Parks Canada. Banff National Park Retrieved May 19, 2016. 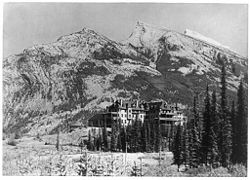 ↑ Banff Springs Hotel History Retrieved May 19, 2016. ↑ Alberta Municipal Affairs Improvement District No. 9 (Banff) Retrieved May 19, 2016. ↑ UNESCO World Heritage Centre. 1992. Canadian Rocky Mountain Parks Retrieved November 21, 2007. Fedje, Daryl W., and James M. White. Vermilion Lakes archaeology and paleoecology Trans-Canada Highway mitigation in Banff National Park. Microfiche report series, 463. [Ottawa]: Environment Canada, Parks Canada, 1988. Hebblewhite, Mark, Daniel Pletscher, and Paul Paquet. Elk population dynamics in areas with and without predation by recolonizing wolves in Banff National Park, Alberta. Canadian Journal of Zoology. 80 (2002): 789-799. Hildebrandt, Walter. Historical analysis of Parks Canada and Banff National Park. 1968-1995. Canada: s.n., 1995. Paquet, P.C., M.L. Gibeau, S. Herrero, J. Jorgenson, and J. Green. Wildlife corridors in the Bow River Valley, Alberta: A strategy for maintaining well-distributed, viable populations of wildlife. A Report to the Bow River Valley Corridor Task Force, 1994. Banff National Park of Canada. Official Banff National Park website. Town of Banff. Official Town of Banff Website. Banff National Park. Canadian Mountain Encyclopedia. History of "Banff National Park"
This page was last modified on 19 May 2016, at 22:48.